‘There Was an Old Sailor’ was reviewed on radio. A brief transcript is here. Gabrielle Wang’s launch of ‘The Race for the Chinese Zodiac’ was great fun. Gabi was joined by illustrator Sally Rippon who with designer Regine Abos created the illustrations and Maryann Ballantyne of Black Dog Books who published ‘The Race for the Chinese Zodiac’. See pics and more of the launch here. Look out for the wonderful cake! It’s a lovely story with gorgeous illustrations. Yesterday, I did a reading at Enchanted by Books, new children’s bookshop in Williamstown (Ferguson St). I was joined by Gabrielle Wang and later Marjory Gardner was there. It was great fun. Laura and Maria have created a lovely space for reading and were wonderfully welcoming. I’ll be back there in March, reading again. Today I’m off to Book Bonding in Niddrie (Keilor Rd) for the launch of Gabrielle’s new book, her first picture book. ‘The Race for the Chinese Zodiac’ (published by Black Dog Books) is a story about how the animals were selected for the Chinese Zodiac. I had a sneak preview listening to Gabrielle read yesterday and am looking forward to seeing this lovely book launch into the world. On Saturday, I drove to Castlemaine, north-west of Melbourne for a SCBWI meeting which included a mini-launch of ‘There Was an Old Sailor’. Despite a hiccup because of an accident on the freeway, I was there in plenty of time. The meeting was in Stonemans Book Room which is a wonderful bookshop with a mix of new and second-hand books. Perfect place to while away an hour or three. But not Saturday. No whiling happening. We set up for the meeting in the middle of bookshelves. Our lecturn was a bookstand. It was fabulous. First, Bernadette Kelly who talked about how she started writing. As well as a very strong sense of purpose, Bernadette acknowledges a level of serendipity in her beginning. Perhaps that’s the secret…put yourself in the world so that things can happen. She also talked about a great program she ran at her local school encouraging primary school children to write and illustrate and to see their work in print. Glenda Millard was our second member speaker. Most of the assemblage were familiar with her work so she talked about her world and the people around her. She grew up at Campbell’s Creek on the edge of Castlemaine, so was able to point to landmarks we could all see. She had memories of Stonemans too. Her characters are drawn from those who peopled her youth. I guess that’s why they seem so real. After afternoon tea, Glenda launched ‘There Was an Old Sailor’, reciting rhymes that she recalls from her childhood and suggesting that ‘There Was an Old Sailor’ may enter the consciousness of today’s children and stay with them. Wouldn’t that be lovely? I read the book, showing how I use the bollard sailor in classrooms. Our final speaker was Ann Haddon of Books Illustrated. She’d brought samples of their picture book art and shared the journey she and Ann James have made with Books Illustrated. In a lovely and unexpected twist, she said that one of the images from ‘There Was an Old Sailor’ is off to Bologna with them as part of an Aust Publishers Assoc exhibition. Here‘s a link for Sharon Greenaway’s report and pics from Saturday. Then to top off a great Saturday, I woke on Sunday to discover a wonderful review of ‘There Was an Old Sailor’ in the Sunday Age. Spent the whole day grinning! I’m more than halfway through my blog tour for ‘There Was an Old Sailor’. It’s great fun and has stretched me to look at why I wrote the story the way I did, and how. There were elements I’d forgotten, like the animals that were included, discarded then included. I’d forgotten the challenges of working within a frame. It also reminded me about the wonders of the internet. I’ve been so flatchat this week with myriad other things that I’d never had been able to make half the visits I had, if they were reliant on me getting anywhere and sounding half-rational. But along the way, I’ve also discovered a new word and that adventure can be found almost anywhere. The new word is ‘AUDIENT’, as in ‘an audient’, the single witness to a performance. Yano, the singular of audience. A great word, which should be in the dictionary! It’s a small world. Yesterday, I met an American friend in town and showed him some of our treasures. (State Library La Trobe Reading Room, 333 Collins St foyer, gothic ANZ bank building, zoo, Queen Victoria market, Melbourne weather) We met three people I knew, leaving him with the impression Melbourne is really just a village. And if you are open to it, we discovered that adventure even includes being offloaded when lightning kills the power to the trains. Even in the rain. It was fascinating to stand in the rain, watching people and process at work. Even though the western links of the railway network were at a standstill because of the power outage, trains kept coming that far and disgorging even more people onto a station and surrounds already overfull. Some people calmly called for rescue via mobile phone. Others railed at the gods. Others railed at the railways staff. Others headed for the bus up around the corner. Some knocked on windows of occupied taxis to see if they could double up. Two people even cadged a lift with a stranger who was going their way. Then ‘contingency plans’ kicked in and orange-coated rail bods shepherded as they could, and frustrated commuters swarmed each time a bus arrived. My American tourist companion and I explored a number of options but mostly just watched human nature in action. And eventually made our way home. 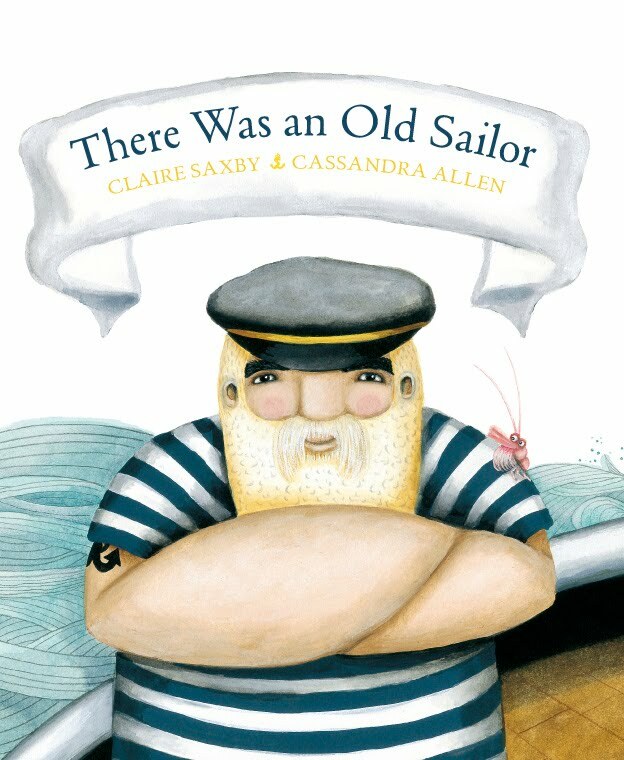 And then last night, I spoke to a local acquaintance who knows Cassandra Allen, the illustrator of ‘There Was an Old Sailor’, even naming his daughter after her. And I realised I knew her. She worked on the local literary festival youth committee with my son. Small, small world. And Melbourne was wet wet wet. Fantabulous! First up I’m off to Western Australia and Sally Murphy’s blog. Yesterday marked the inaugural meeting of the First Tuesday Children’s Book Club. We 18 gathered in Mother Superior’s Chambers at the wonderful Abbotsford Convent. The book club is for anyone interested in children’s literature in its myriad forms. Yesterday we looked at ‘Where the Wild Things Are’. We talked about the three incarnations: the original picture book (published 1963); the movie (2009) and the novelisation (also 2009 and called ‘The Wild Things’). Discussion ranged broadly from the intended target audience, initial reactions to each ‘version’ and much more. We also began drawing a list of books to be discussed at upcoming meetings. Some are very recent, others much older. One book suggested was released in the 1930’s and will probably be too difficult to source. I’m really looking forward to the next meeting. Alison, Bren, Kay, Dee, Kim and Ali. We had a lovely time, and I doubt that anyone watching would have imagined that we didn’t all know each other very well. The internet comes in for its share of criticism as an anti social entity, but it is not always so. It was great to be able to match voices and faces to the online words. I also had a chance to go into the most amazing cake decoration shop in one of Melbourne’s laneways. I found some more cookie cutters and other bits and bobs for the launch of ‘There Was an Old Sailor’ on 27 Feb. I came home to an email that may launch Old Sailor into a new form…more news on that if it evolves.